SimpleSend lets you define complex file sets for upload. These file sets can contain any type of file, whole folders or folder trees. File sets can also be defined via the command line, database query or by importing a CSV (comma separated values) or SimpleIndex IDX file. The import file is a simple comma-delimited text file containing index field data and file paths. These are generated automatically by SimpleIndex or they can be exported from Excel, Access, most databases and other document scanning applications. Each file set can be associated with its own FTP Transfer. This lets you send different files to different folders on one server, or to completely different servers in one batch. SSL support eliminates the security concerns with FTP and lets you transfer private data while complying with regulations like HIPAA. The email transfer component lets you send files to one or more recipients. Each file set can be associated with its own email component, so you can create multiple emails to multiple recipients at once. 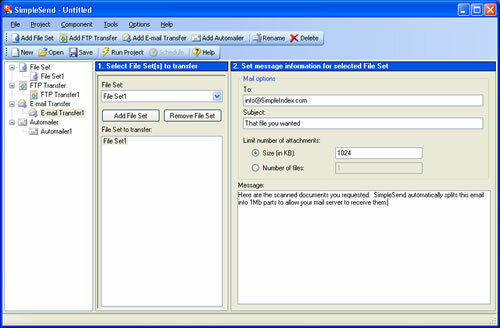 If you are importing from CSV file or database, field data can be inserted as the recipient, subject, file attachment or anywhere in the message body. Send customized email messages to hundreds of addresses, each with their own specific file attachment. A typical example where this is useful is a mail room. SimpleCoversheet is used to create barcodes for each employee. The mail room staff opens the mail for each, places the appropriate barcode in front of each employee's mail and scans it with SimpleIndex. The entire batch may then be scanned, barcodes for each employee recognized and the files sent to their inbox automatically with SimpleSend. These are the same options available for CSV files in the Email Transfer component. Use the Automailer Component to use a database as the source list of files or recipients, or to send personalized emails without files. Though the automailer component was designed for sending multiple files to multiple recipients, it can also be used to correspond with customers listed in your custom database application. Instead of maintaining two separate databases for your email lists, SimpleSend lets you use existing data to populate recipient lists. 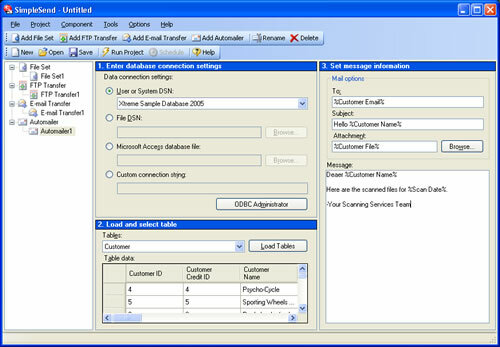 You may also personalize each email with by inserting field values from your database anywhere in the subject or body.